Last week I encountered this error when I was processing my SSAS Cube for the Januari 2011 figures. This error also occured if I tried to process a dimension. 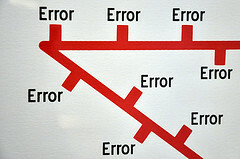 In the last months no changes were made in my datawarehouse project, so I was very suprised to get this error message. This error messsage is nice from a technical perspective but it will not tell what I need to do. It would be nice if it could tell me which account names or security ID's are not mapped. After some research in my cube I found the problem. In my datawarehouse project I have defined roles for people who can access my cube. In one of these roles, an active directory account was configured for a user who left my company this month. His Active Directory account was removed from Active Directory. So my datawarehouse project roles contained Active Directory accounts which does not exist anymore. Solution: Remove all Active Directory accounts from the roles which does not exists anymore in Active Directory.